Over 300 fire calls a day, Tsunami, megafloods and a disaster call any moment in the accident-prone & the fire-prone city of Chennai, firefighting seems like a child’s play for Ms. Meenakshi Vijayakumar. One of the most popular women officers of Tamil Nadu. In October 2012, the fire department received a call. It was a building collapse, in one of the buzzing streets of Triplicane Chennai. Meenakshi and team rushed to the spot immediately, only to find the multi-story building collapsed to a heap of debris. It was fortunate that two beams were holding the lives of a mother and son. Caught in between the second and fourth floor. “It was a precarious situation” Meenakshi explains. “Since it was a collapsed building, we could not use any sophisticated equipment” and Meenakshi had to take a quick call. They were left with no choice but only use the primitive handheld instruments. The rescue operation had to be carried out from the rooftop. The heap of debris had to be cleared to save the two lives. Meenakshi struggled for almost 7-8 hours to clear the debris. In the end, the mother and son were saved by the team. “It was that moment of saving lives, I felt the happiest, it is the most unforgettable incident in my life” Meenakshi recollects. There are no words to describe the happiness that she saw in the eyes of the survivors. She was happy to see the family together later. For this courageous act, Meenakshi received President’s Gallantry Award in the year 2013. 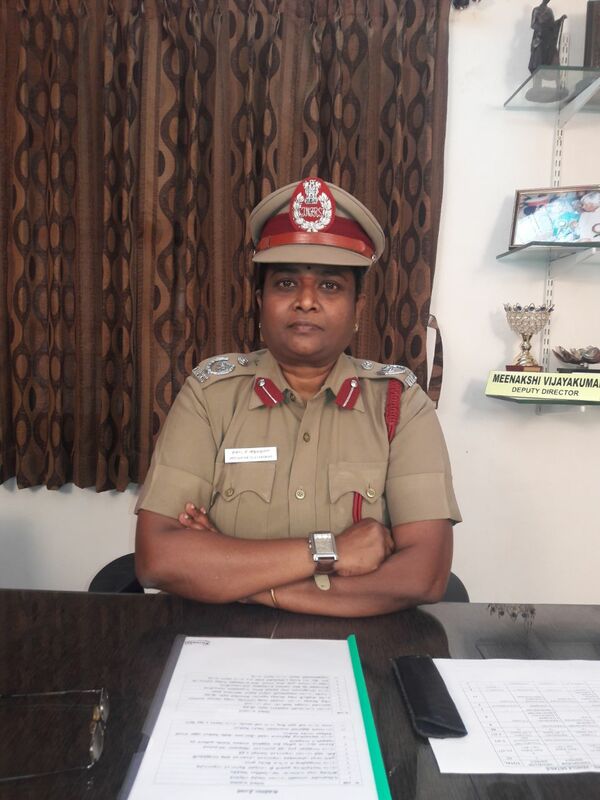 Meenakshi Vijayakumar, presently the Deputy Director (Headquarters) Tamil Nadu Fire and Rescue Services, joined the fire department in the year 2003 as a District Fire Officer for North Chennai District. 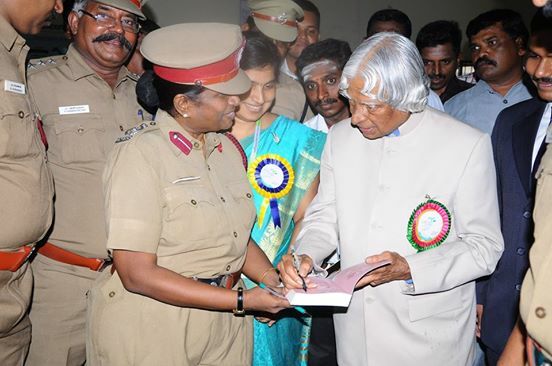 She is one of the first woman officers to join the male-dominated profession in Chennai city. Before joining the Tamil Nadu Fire Rescue Services (TNFRS), Meenakshi worked as an Assistant Professor of English in a college in Tamil Nadu. What motivated Meenakshi to take up this unusual job? “A uniformed job gives me the ability to serve a diversity of people,” Meenakshi tells us. She also points out that public service is nothing new for her family. She is the granddaughter of Late Mr. Kakkan, Ex-Minister of Parliament and a prominent Congress leader. Her parents were IAS officers. She was brought up seeing the service-mindedness of her family members. Life is not mundane for Meenakshi, as any other firefighter. “I have given 200% for the job” She quips. Initially, as a woman, she was mocked and not accepted by the male-dominated force but, she has never succumbed to that. Slowly, she was accepted and treated equally by the fellow officers. Meenakshi was a part of the rescue operation during Tsunami in the year 2004. She stood strong on Marina Beach Chennai, while she witnessed the second Tsunami and ensured support. For her dedication during the Tsunami havoc, the then Chief Minister of Tamil Nadu appreciated her efforts. 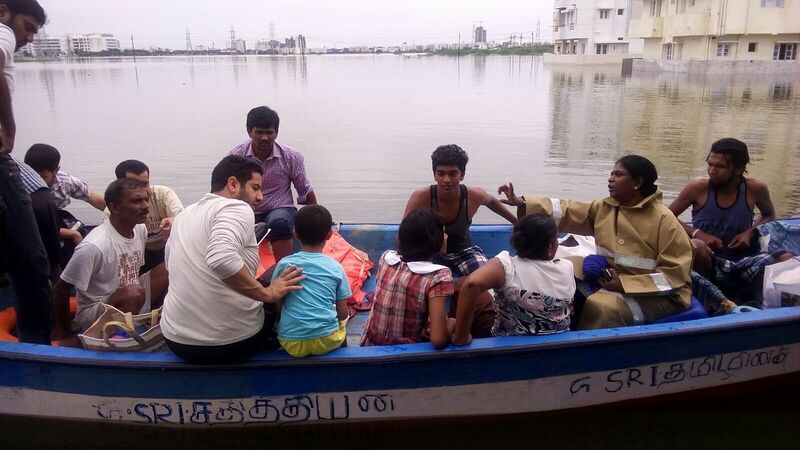 Even during the Mega Floods of Chennai 2015, Meenakshi was able to save many lives, especially from one of the inundated hospitals she was able to rescue over 100 lives. She was also on the field of the 12-day long operation during the Chennai Silks fire accident. The burning building got so much of media attention as it was in T Nagar, the hub and one of the busiest streets of Chennai. Even in this case, the operation had to be carried out with limited support of the equipment as the roads were too narrow. “I wanted to take every opportunity to prove myself” Meenakshi commits. 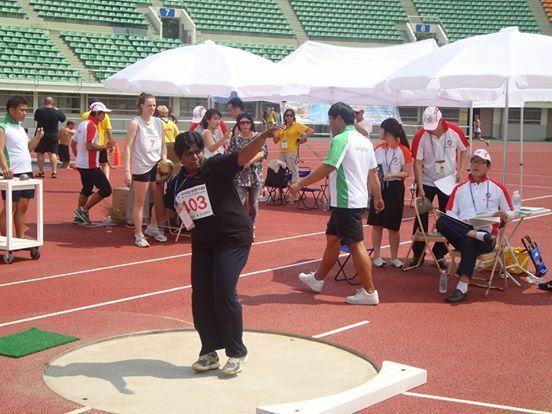 And this spirit made her win a gold medal in shot put in the World Fire Fighters Games in South Korea, 2010. She has won a gold medal for tennis in Australia in the year 2012. She has also won a bronze medal for badminton in the World Police and Fire Games held in Los Angeles in the year 2017. She is the first woman fire officer to win medals for India. For her undaunted spirit and services, Meenakshi has won so many medals and awards. She was presented the Anna Medal (2017) recently, for her absolute dedication to the service from the Government of Tamil Nadu. Was Meenakshi the only lady fire officer in Tamil Nadu? In India, fire safety always takes the backburner. What plans does the department have to create public awareness? A lot of times when the fire department approaches citizens for a fire safety drill, people do not show interest. They do not want to participate. She recollects the Carton Towers incident. “All the escape routes were covered. A case of sheer indifference towards other lives.” She quotes. “In Kumbakonam fire accident, a lot of children went back inside the burning school to get back their books and belongings. Parents do not teach the importance of life” says Meenakshi. We must teach our children the importance of lives. Life is more important than materials. What does Meenakshi want to tell the aspiring women firefighters of India? “There is no such thing as male or female when you are in a uniform. You are an officer. You have to give whatever it takes. We should not differentiate ourselves first. We bring a life to this earth. Since we are also in a job where we can save a lot of lives, first we should have the mental caliber and we should believe in ourselves. Women are strong both physically and mentally. Give your best always in whatever field you are!” says Meenakshi. Women should not think about their weaknesses. They should have a fighter spirit and come out of any hindrances in their lives. “Dedicate yourself and believe yourself. There is no difference between a man and woman, we are all human beings.” Meenakshi concludes. For us, Meenakshi is truly an inspiration and a fire champion. We are proud of you! Author: Savitha Sampath is a Freelance Digital Marketing Consultant, mom, and an accidental writer.